The Plant-Soil Ecology group aims to underpin key interactions at soil level that regulate ecosystem processes and link structure and function under natural or man-made ecosystems. Our perspective is to fetch natural solutions for man-made problems. Specifically, focusing on nutrient availability as a key factor that affects biotic and abiotic interactions, and thus regulates ecosystem functioning. As symbioses are a key factor for success, being the rule rather than the exception, we study nutrient availability in natural ecosystems as a factor responsible for biotic-abiotic interactions to explain adaptation mechanisms and species coexistence in diverse communities and ecosystems. We then apply this knowledge to manipulate biotic interactions (e.g. plant-microbe, microbe-microbe) to provide the desired services and thus reduce or eliminate the need for external inputs to promote a cleaner agricultural production.The challenge is to favour positive interactions, while reducing the negative ones. 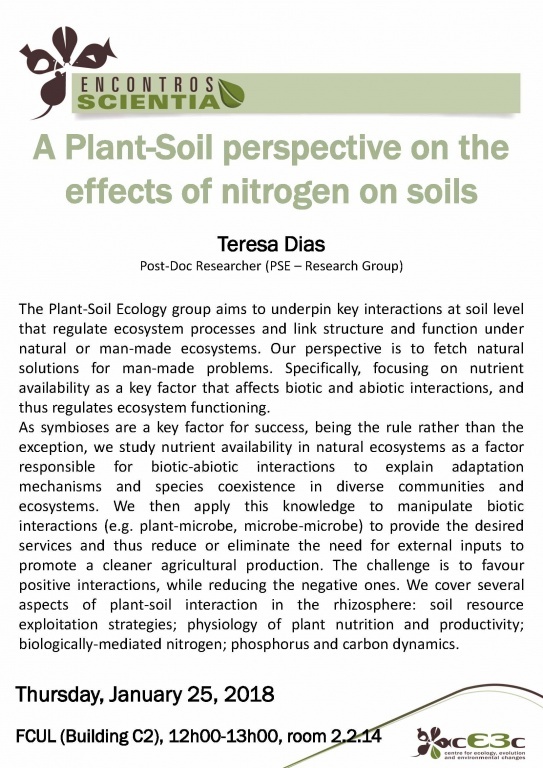 We cover several aspects of plant-soil interaction in the rhizosphere: soil resource exploitation strategies; physiology of plant nutrition and productivity; biologically-mediated nitrogen; phosphorus and carbon dynamics.